Ketoconazole () (synthetic imidazole antifungal drug used primarily to treat fungal infections. Ketoconazole is sold commercially as a tablet for oral administration (although this use has been discontinued in a number of countries), and in a variety of formulations for topical administration, such as creams (used to treat tinea; cutaneous candidiasis, including candidal paronychia; and pityriasis versicolor) and shampoos (used primarily to treat dandruff—seborrhoeic dermatitis of the scalp). The side effects of ketoconazole are sometimes harnessed in the treatment of non-fungal conditions. While ketoconazole blocks the synthesis of the sterol ergosterol in fungi, in human beings, at high dosages (>800 mg/day), it potently inhibits the activity of several enzymes necessary for the conversion of cholesterol to steroid hormones such as testosterone and cortisol. Specifically, ketoconazole has been shown to inhibit cholesterol side-chain cleavage enzyme, which converts cholesterol to pregnenolone, 17α-hydroxylase and 17,20-lyase, which convert pregnenolone into androgens, and 11β-hydoxylase, which converts 11-deoxycortisol to cortisol. All of these enzymes are mitochondrial cytochrome p450 enzymes. Based on these antiandrogen and antiglucocorticoid effects, ketoconazole has been used with some success as a second-line treatment for certain forms of advanced prostate cancer and for the suppression of glucocorticoid synthesis in the treatment of Cushing's syndrome. However, in the treatment of prostate cancer, concomitant glucocorticoid administration is needed to prevent adrenal insufficiency. Ketoconazole has additionally been used, in lower dosages, to treat hirsutism and, in combination with a GnRH analogue, male-limited precocious puberty. In any case, the risk of hepatotoxicity with ketoconazole limits its use in all of these indications, especially in those that are benign such as hirsutism. This medication is also sometimes prescribed by veterinarians for use on pets, often as unflavored tablets that may need to be cut to smaller size for correct dosage. As an antifungal, ketoconazole is structurally similar to imidazole, and interferes with the fungal synthesis of ergosterol, a constituent of fungal cell membranes, as well as certain enzymes. As with all azole antifungal agents, ketoconazole works principally by inhibiting the enzyme cytochrome P450 14α-demethylase (P45014DM). This enzyme participates in the sterol biosynthesis pathway that leads from lanosterol to ergosterol. Lower doses of fluconazole and itraconazole are required to kill fungi compared to ketoconazole, as they have been found to have a greater affinity for fungal cell membranes. It is a pregnancy category C drug because animal testing has shown it to cause teratogenesis when administered in high doses. Recently, the administration of systemic ketoconazole to two pregnant women for treatment of Cushing's syndrome was reported to have no adverse effects, but this small sample precludes drawing any meaningful conclusions. A subsequent trial in Europe failed to show a risk to infants of mothers receiving ketoconazole. Ketoconazole was discovered in 1976 at Janssen Pharmaceuticals. ^ a b c Phillips RM, Rosen T (2013). "Topical Antifungal Agents". In Wolverton SE. Comprehensive Dermatologic Therapy (3rd ed.). Philadelphia: Saunders. pp. 460–472. ^ Neider R, Fritsch PO (2012). "Other Eczematous Eruptions". In Bolognia JL. Dermatology (3rd ed.). Philadelphia: Saunders. pp. 219–221. ^ Young BK, Brodell RT, Cooper KD (2013). "Therapeutic Shampoos". In Wolverton SE. Comprehensive Dermatologic Therapy (3rd ed.). Philadelphia: Saunders. pp. 562–569. ^ Kauffman CA (2004). "Introduction to the Mycoses". In Goldman L, Ausiello, D. Cecil Textbook of Medicine (22nd ed.). Philadelphia: Saunders. p. 2043. ^ a b c d e f g h i Kenneth L. Becker (2001). Principles and Practice of Endocrinology and Metabolism. Lippincott Williams & Wilkins. pp. 1197–. ^ Loose, D (May 1983). "Ketoconazole blocks adrenal steroidogenesis by inhibiting cytochrome P450-dependent enzymes.". JCI 71 (5): 1495–1499. ^ Zelefsky MJ, Eastham JA, Sartor OA, Kantoff P (2008). DeVita VT, Lawrence TS, Rosenberg SA, ed. Cancer: Principles & Practice of Oncology (8th ed.). Philadelphia: Lippincott Williams & Wilkins. p. 1443. ^ Loli P, Berselli ME, Tagliaferri M (December 1986). "Use of ketoconazole in the treatment of Cushing's syndrome". J. Clin. Endocrinol. Metab. 63 (6): 1365–71. ^ Loose DS, Kan PB, Hirst MA, Marcus RA, Feldman D (May 1983). "Ketoconazole blocks adrenal steroidogenesis by inhibiting cytochrome P450-dependent enzymes". J. Clin. Invest. 71 (5): 1495–9. ^ Witjes FJ, Debruyne FM, Fernandez del Moral P, Geboers AD (May 1989). "Ketoconazole high dose in management of hormonally pretreated patients with progressive metastatic prostate cancer. Dutch South-Eastern Urological Cooperative Group". Urology 33 (5): 411–5. ^ De Coster R, Wouters W, Bruynseels J (January 1996). "P450-dependent enzymes as targets for prostate cancer therapy". J. Steroid Biochem. Mol. Biol. 56 (1–6 Spec No): 133–43. ^ Eil C (August 1992). "Ketoconazole binds to the human androgen receptor". Horm. Metab. Res. 24 (8): 367–70. ^ Loose DS, Stover EP, Feldman D (1983). "Ketoconazole binds to glucocorticoid receptors and exhibits glucocorticoid antagonist activity in cultured cells". J. Clin. Invest. 72 (1): 404–8. ^ Chin TW, Loeb M, Fong IW (August 1995). "Effects of an acidic beverage (Glass of Orange Juice) on absorption of ketoconazole". Antimicrobial Agents and Chemotherapy 39 (8): 1671–5. ^ Cartledge, JD; Midgley, J; Gazzard, BG (1997). "Clinically significant azole cross-resistance in Candida isolates from HIV-positive patients with oral candidosis.". AIDS 11 (15): 1839–44. ^ Sanglard, D; Ischer, F; Monod, M; Bille, J (1997). "Cloning of Candida albicans genes conferring resistance to azole antifungal agents: characterization of CDR2, a new multidrug ABC transporter gene.". Microbiology 143 (Pt 2): 405–16. ^ McElwee KJ, Shapiro JS (June 2012). "Promising therapies for treating and/or preventing androgenic alopecia". Skin Therapy Lett. 17 (6): 1–4. ^ Piérard-Franchimont C, De Doncker P, Cauwenbergh G, Piérard GE (1998). "Ketoconazole shampoo: effect of long-term use in androgenic alopecia". Dermatology (Basel) 196 (4): 474–7. ^ Piérard-Franchimont C, Goffin V, Henry F, Uhoda I, Braham C, Piérard GE (October 2002). 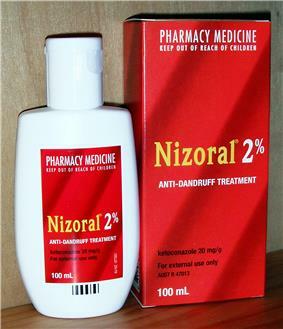 "Nudging hair shedding by antidandruff shampoos. A comparison of 1% ketoconazole, 1% piroctone olamine and 1% zinc pyrithione formulations". Int J Cosmet Sci 24 (5): 249–56. ^ Khandpur S, Suman M, Reddy BS (August 2002). "Comparative efficacy of various treatment regimens for androgenetic alopecia in men". J. Dermatol. 29 (8): 489–98. ^ Amado JA, Pesquera C, Gonzalez EM, Otero M, Freijanes J, Alvarez A (March 1990). "Successful treatment with ketoconazole of Cushing's syndrome in pregnancy". Postgrad Med J 66 (773): 221–3. ^ Berwaerts J, Verhelst J, Mahler C, Abs R (June 1999). "Cushing's syndrome in pregnancy treated by ketoconazole: case report and review of the literature". Gynecol. Endocrinol. 13 (3): 175–82. ^ Kazy Z, Puhó E, Czeizel AE (March 2005). "Population-based case-control study of oral ketoconazole treatment for birth outcomes". Congenit Anom (Kyoto) 45 (1): 5–8. ^ Heeres J, Backx LJ, Mostmans JH, Van Cutsem J (August 1979). "Antimycotic imidazoles. part 4. Synthesis and antifungal activity of ketoconazole, a new potent orally active broad-spectrum antifungal agent". J. Med. Chem. 22 (8): 1003–5. Piérard-Franchimont C, Goffin V, Decroix J, Piérard GE (2002). "A multicenter randomized trial of ketoconazole 2% and zinc pyrithione 1% shampoos in severe dandruff and seborrheic dermatitis". Skin Pharmacol. Appl. Skin Physiol. 15 (6): 434–41. Eil C (Aug 1992). "Ketoconazole binds to the human androgen receptor". Horm Metab Res 24 (8): 367–370.